​The Ceský Terrier originated in Czechoslovakia (modern-day Czech Republic and Slovakia). Like other terriers, it was bred to 'go to ground'. They will chase prey into their dens where other dogs, such as hounds, cannot follow. Secondarily, it was developed specifically for the show ring, which also makes it a suitable companion breed. Prized in its homeland, the Ceský Terrier is considered the National Dog of the Czech Republic. When Czechoslovakia existed there was a ban on exporting these dogs for a short time. Unlike most dog breeds, the origin of the Ceský Terrier is well documented. It was created in Czechoslovakia after WWII by František Horák. 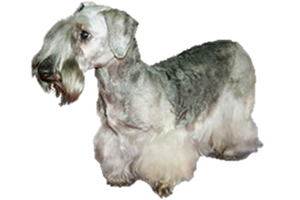 He began by crossing Scottish and Sealyham Terriers in 1949 and then back to the Sealyhams in the 1980s. Some experts have suggested that the Dandie Dinmont or Wirehaired Dachshunds were added at some point, but this has not been proven. The Fédération Cynologique Internationale granted the Ceský Terrier full recognition in 1963. Today the Ceský Terrier is recognized by all major kennel clubs around the world. Is the Ceský Terrier Right for You?